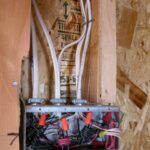 In older homes, the electrical system is likely made up of single conductor wires. Today, however, much of electrical wiring is done with multiconductor cables because of their convenience of use. 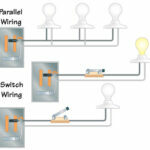 If you are doing electrical work on your home, you can use either or a combination of both. The two most common types of single conductor wires are THW and THWN/THHN, which are protected by metal or plastic sheathing. The wires themselves can be either solid or stranded. Solid-core wire produces the best connections, but its stiffness makes it more difficult than stranded wire to route through conduit. You can purchase wire by the foot or in spools that range from 50 to 500 feet. 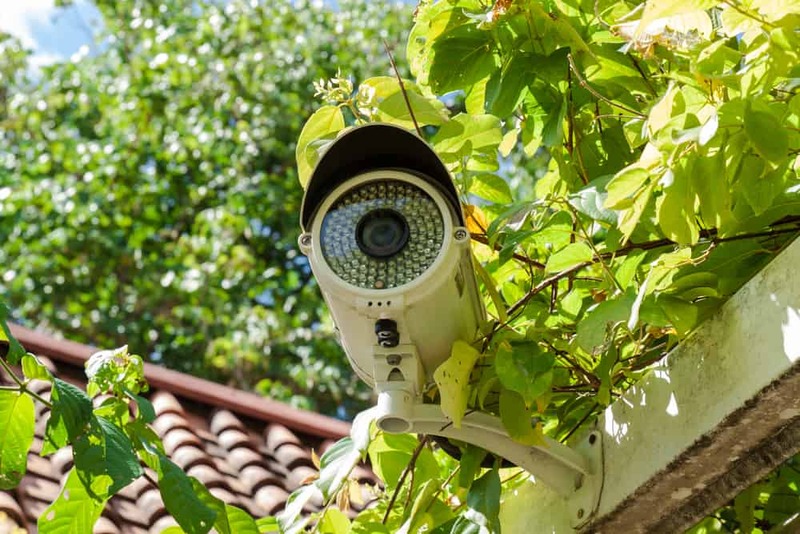 Depending on your installation, make sure to check the rating for indoor or outdoor application as well as for temperature tolerance. 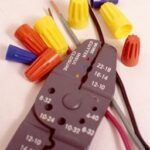 The most common multiconductor cable is made from metal or plastic and contains a neutral wire, a “hot” wire (or two), and a grounding wire. The neutral and hot wires are insulated by a thermoplastic material; the grounding wire may or may not be insulated. The wires are color-coded to guard against connection errors. Neutral wires are white or gray, grounding wires are green, and hot wires are any other color. 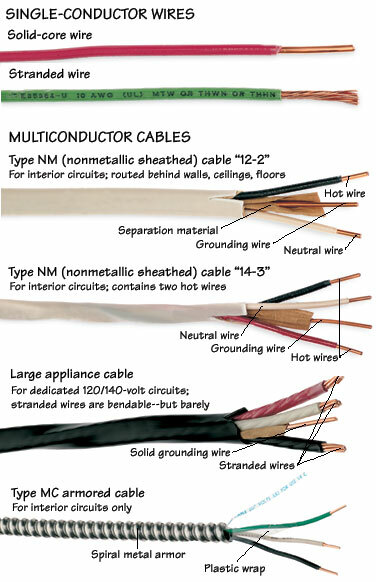 The cables shown here include: Two kinds of type NM cable, described above, which are the common choices for interior installations. The most recent version, known as NM-B, can only be used in dry locations and tolerates heat up to 140 degrees F.
NM and NM-B cable can be purchased by the foot and also come in boxes that hold anywhere from 25 to 250 feet of it. A larger version of NM cable, called large appliance cable, is sheathed in black, and because of its bulk contains stranded rather than solid wire to make routing it easier. Type MC armored cable is sheathed in spiral metal, but because of its expense it is not commonly used for interior applications. The various types of cable are also designated by how many conductors they contain and their size. For example, a cable identified as “14-2” with ground has one neutral and one hot wire as well as a grounding wire. The #14, designated by the American Wire Gauge, stands for the diameter of the wires alone, without insulation. The larger the diameter, the greater the wire’s capacity is to carry current. A conductor’s designation is stamped on the cable sheathing as well as on each wire. The mostly commonly used metal for wires is copper, due to its efficiency as a conductor. Wire also comes in aluminum and aluminum clad with copper, but, because these are not as efficient in conducting current, the wires need to be larger to achieve the same capacity. Before using either of these alternatives, check local codes.